Lorie is our Office Manager and Optician. 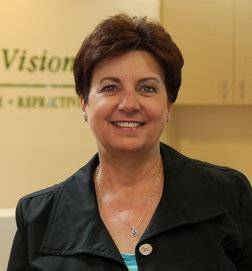 She has been working at Complete Family Vision Care Optometry, Inc for over 6 years. Lorie enjoys pre-testing and helping patients discover their new look! She will be happy to discuss options including tints, transitions, and polarized lenses. Lorie and Dr. White have been married for 33 years and still enjoy traveling together to Dr. White’s many lectures and meetings. She and Dr. White have raised 3 wonderful boys, and now they are grown she has time to help out in the practice.